SMARTY Trend head device for Volkswagen Golf VII. The Volkswagen Golf VII is a fairly new and modern car. Its main feature is that it is a small, economical car to the same German build quality. It is ideal for large cities where traffic jams are a frequent daily occurrence. This model has earned special respect since its debut, at the moment this car has changed quite a lot, a large number of new features, a new design, and a good value for money. But unfortunately, as for the improvement of this car, the situation here is a bit worse. The fact is that an appeal to the official representatives of the Volkswagen company is a rather expensive service. In this case, the company SMARTY Trend is always ready to help you. We will perform the selection of head unit for your car, taking into account all your wishes. Many motorists are interested in the question of how the installation process will go and what kind of work needs to be done. All SMARTY Trend receivers are regular, that is, they are specifically designed for this brand and model of car. Thus, there is no need for extra work to install the head unit. Connecting the device is performed on the principle of the connector in the connector, the set will be everything you need to install the radio. The quality of materials, the new head unit is not inferior to the original device. Despite all the new functionality that is available in this unit, you can connect a large number of accessories. In this case, the owner of this car additionally installed a DVR, TPMS, rear-view camera and a WI-FI modem. Thereby significantly multiplying the range of functionality in this car. Connection of extra devices is usually performed using USB. In modern cars, this function is not new. It allows you to synchronize your phone, copy the phone book to the SMARTY Trend head unit and make phone calls without being distracted from driving. Connect by Blutooth. 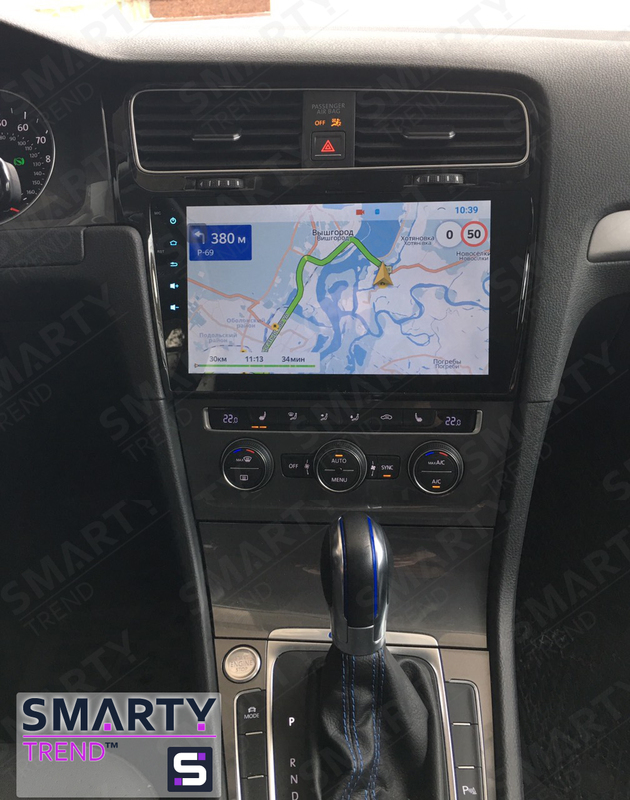 The functionality of Volkswagen Golf VII was supplemented not only thanks to the new accessories, but basically with the help of the SMARTY Trend head unit. High-quality assembly, HD screen, the Android operating system is only a small part of the new features that are now available in this car. You can also note the external transformations of the center console, the powerful 1.8 GHz Octa-core processor (Allwinner T8) allows you to work in several applications at the same time, without any hangs. The company SMARTY Trend is always ready to help you, improve your car today! Tag: Smarty Trend, Android head unit, Volkswagen Golf VII, Android, Head Unit, Multimedia, Entertainment, Car audio.